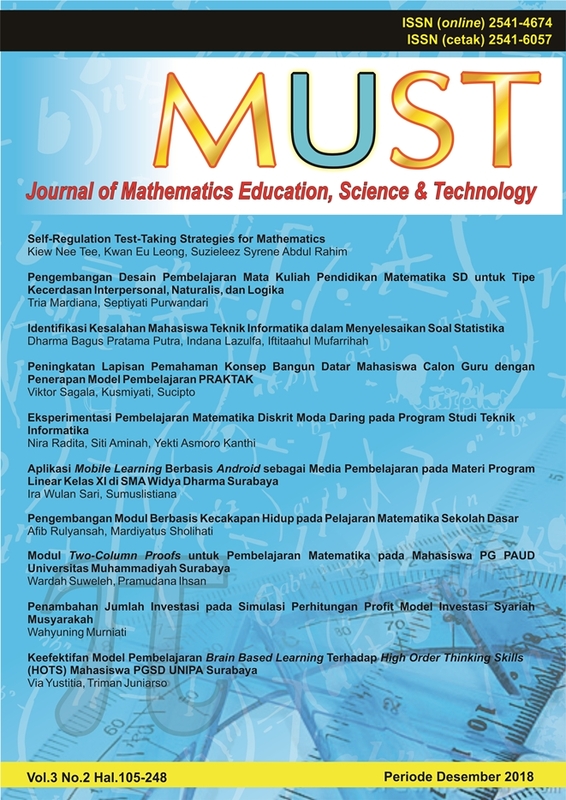 MUST is a journal of mathematics education, science, and technology published by the Faculty of Teacher Training and Education, Muhammadiyah University of Surabaya. This journal focuses on the publication of research results and scientific articles on mathematics education, science, and technology. MUST Journal is published twice in a year, on July and December with ISSN Print: 2541-6057 and e-ISSN: 2541-4674. Based on the decree of Strengthening Research and Development General Director, Ministry of Research, Technology, and Higher Education in Indonesia No. 21/E/KPT/2018 about Accreditation Rating of Scientific Journal 1st Period, 2018, MUST Journal included in Rank 4. Starting January 1st, 2019, MUST Journal applies a plagiarism check before the review stage by the reviewer. MUST Journal Vol. 4 No. 1, July 2019 will be published.